Your source for customer ingredient solutions. 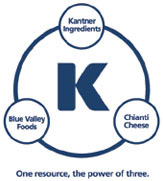 Introducing Kantner, a powerful new ingredients partner that offers quality ingredients, packaging and production resources, and innovative management and service capabilities of three of the top names in the industry: Kantner Ingredients, Blue Valley Foods, Chianti Cheese. From dairy proteins, specialty dry-ingredient blends, and authentic italian cheeses to natural cheese and cheese substitutes, only Kantner offers you the ease and the custom ingredient solutions your company is looking for, all under one roof.